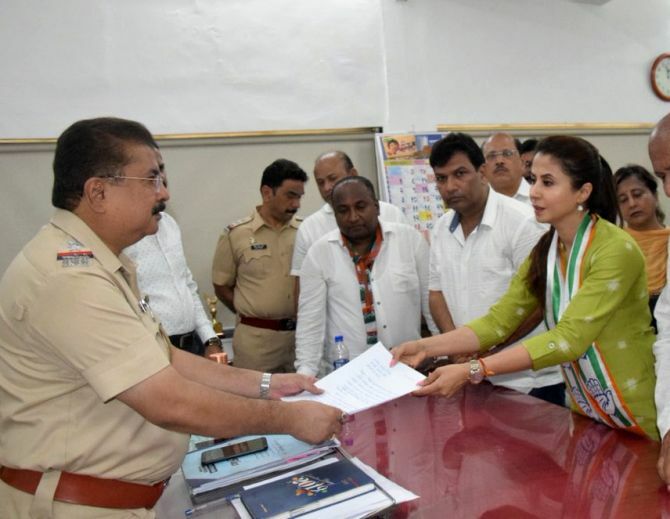 Actor-turned-politician Urmila Matondkar was on Monday granted police protection after a group of 'Bharatiya Janata Party supporters' clashed with Congress workers during her poll campaign in north Mumbai. Matondkar told reporters that she lodged a police complaint 'after some BJP workers barged into her rally'. In her complaint, Matondkar also demanded strict action against the 'BJP supporters' for violating the model code of conduct. Around 25 'supporters' of the BJP carrying the party flags chanted 'Modi, Modi', she alleged. Matondkar also said she was shocked by the 'blatant violation' of the model code of conduct by the workers of the ruling party, and blamed the BJP for 'creating fear'. Matondkar also said that those who 'barged' into the rally were not common people, but activists of the BJP. The common people will not behave in 'violent ways' like these persons, she added. Matondkar tweeted that she will face with strength and courage those who would try to push her to the wall. Later, in a video message posted on the micro-blogging website, she said she won't get scared by such acts. "I come from Shivaji Maharaj's holy land, where respecting women is considered the most important thing. In such a situation, I will not step back," she said. In Solapur will Bhim-AIMIM end national parties' run?